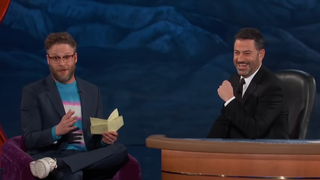 Jimmy Kimmel has been doing his show from his hometown of Las Vegas all week, wrapping up on Thursday with a typically garrulous appearance from Seth Rogen, who, as it turns out, has something of a history with the city. Whipping out a list of Las Vegas memories for the occasion, Rogen ran down a number of misadventures in The Entertainment Capital Of The World that put those Swingers guys to shame. Apparently, stealing a gondola at the Venetian casino and tooling around the man-made canals is easier than one might think, although Rogen totally assured everyone that he’s not in any way encouraging such behavior. Thankfully more difficult was the younger Rogen’s scheme to set free the famous/infamous white tigers of Vegas magician mainstays Siegfried & Roy, although he joked that maybe it would have been “a mitzvah for everyone” if he’d succeeded at the time, considering. And if there’s more of a story behind the night that Rogen spent a long, long Las Vegas elevator ride enduring comedian Eddie Griffin’s “anti-Semitic rant” against him, well, there is. Topping off his Vegas history with the story of how he and writing partner and lifelong BFF Evan Goldberg did some unsanctioned location work for Knocked Up by attending every Cirque du Soleil show on the Strip on mushrooms, Rogen told Kimmel that that particular experience was something of a mixed bag. Noting that anything sexual becomes “very medical” on ’shrooms, the current cannabis magnate advised Kimmel’s crowd to scope out the subject matter before emulating him there.